Lands End Cottage+441229860228work Self-cateringWith its stunning views and comfortable accommodation, Lands End Cottage is ideal for a relaxing break. 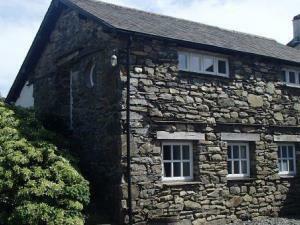 Lands End Cottage is a luxury two bedroomed cottage, with 2 bathrooms and a private garden. On the ground floor is a spacious double room, with plenty of wardrobe space and en-suite shower room. Next to this is the twin room, again with plenty of space to move and a bathroom with a full sized bath. There is a travel cot available if you need it. Upstairs there is a fully fitted kitchen including fridge, electric oven, microwave, dishwasher and freezer. There is a full sized table with enough room for everyone to sit and views down the valley from the window. The living room has TV and plenty of seating, with the feature windows giving views up the valley to the fells in the heart of the lake district. Lands End Cottage sometimes limits bookings to 3 or more days.